As the crowd boards the ferry at Boston's Long Wharf, a sense of anticipation mingles with the smells of saltwater and suntan lotion. Young children tote beach towels and sand pails. Their parents carry coolers filled with picnic supplies. A group of hikers haul their backpacks, while an elderly man clutches a pair of binoculars and a birding guide. It's a diverse crowd, to be sure, but in common they are all embarking on an island adventure. Within moments, the ferry is underway, passing anglers casting their lines off the pier at Castle Island and gliding underneath the bellies of jumbo jets landing at Logan Airport. The spire of the Old North Church, the Custom House tower, and the rest of the city skyline dissolve in the mist, and a cool sea breeze tempers the sultry summer heat. In just 15 minutes, the passengers arrive at Spectacle Island. The canyon walls of Boston's skyscrapers have been replaced by open skies. The tumult of the city streets has been supplanted by the tranquillity of island life. It's hard to believe that this oasis was once home to a variety of less natural functions, including a city landfill, horse-rendering factory, and quarantine station. Now, after nearly 15 years of environmental cleanup, Spectacle Island has been reborn as a 105-acre summertime playground. Opened in 2006, this jewel in the Boston Harbor Islands national park area includes five miles of walking trails, a marina, a swimming beach, and a fishing pier. Formed when glaciers left behind deposits of sand, gravel, rubble, and debris, Spectacle Island had been a dumping ground since its creation. In the 1850s, Boston businessman Nahum Ward moved his industrial operations, including a horse-rendering facility, to the island. (As unpalatable as it may seem by today's standards, before Ward's company, dead horses were dumped into the harbor.) During the 20th century, the island became home to a grease reclamation facility and a city landfill. It is said that the smell of the dump was so foul that in foggy weather ships could get their bearings simply by the stench emanating from the island. For decades after the landfill closed, Spectacle Island was not only a visible eyesore, but also a threat to public health, leeching toxins and pollutants into Boston Harbor. Through a triumph of imagination and engineering acumen, the problem of what to do with the island was solved by yet another challenge: what to do with all the fill excavated from Boston's Big Dig project. In a marriage of the city's two biggest public works projects, the Central Artery/Tunnel Project and the harbor cleanup, 3.5 million cubic yards of excavated material from the Ted Williams Tunnel and other roadways was used to cap and close the landfill and resculpt the island. Once the landfill was closed, two to five feet of topsoil were added and 2,400 trees and 26,000 shrubs were planted. The end result is a rejuvenated island with a wide array of recreational opportunities. 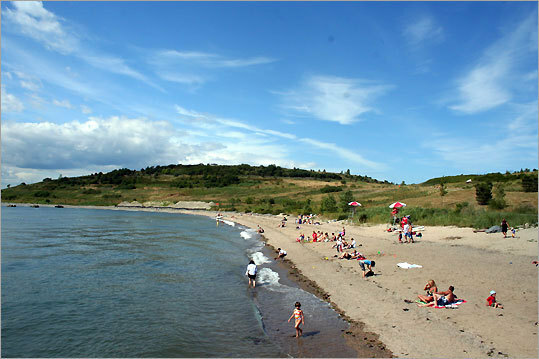 The sandy swimming beach, staffed by lifeguards, is popular with families who want to frolic in the clean harbor waters. (The beach is slated to reopen at the end of the month after being rebuilt in the off-season.) Starting next month, visitors will be able to dip a paddle in the water and kayak around the beach's sheltered cove. Another fun activity on Spectacle Island is to wander along the rocky beach extending from the south side of the pier and search for the many artifacts strewn among the shells, stones, and seaweed. Colorful pieces of sea glass are scattered across the beach, and shards of porcelain and china of varying colors and patterns are abundant. Some of these remnants dredged up and left behind by the exhaling tide date to the 19th century and earlier, and serve as eternal reminders of a time when Bostonians disposed of their trash into the harbor. Keep in mind that the park management forbids removing any of the sea glass and pottery; leave them for other explorers to experience the same thrill of discovery. In addition to relics on the beach, visitors can spot upward of 100 bird species, including bobolinks, warblers, and savannah sparrows. For those of an aquatic bent, stripers, cod, and flounder are among the fish biting near the pier. Fishing poles and nets are available at the visitors center, which has a cafe, restrooms, and exhibits about the island's history, geology, and wildlife. The center's covered porch has a long row of Adirondack and rocking chairs that look out on the harbor and city skyline. It's a perfect place to sit back and enjoy island life. Summer weekends on Spectacle Island are particularly popular since park management offers Sunday jazz concerts, guided tours, and a slew of programming for children. Private boaters can skip the public ferries and tie up at the marina, which has 38 slips. Sailors can stay overnight and enjoy sunsets over the city, Saturday night movies on the pier, and bonfires on the beach. It's a wonderful quirk of fate that what used to be the most environmentally degraded island in the harbor is now its most environmentally friendly. The benches and picnic tables here are made from recycled materials. Solar panels installed on the visitors center power it and the island's small fleet of electric vehicles. The center's composting toilets use no water or chemicals, and the water used in the kitchen and sinks is collected, filtered, and used to irrigate flowers. The walking trails offer both easy strolls and vigorous climbs, and wayfaring signs along the trails impart historical vignettes about the island's past. The scenery dazzles the eye and changes with the seasons. In the spring, pink and white sea roses color the landscape, while in late summer and early fall, migrating monarch butterflies flutter among the plentiful wildflowers. A visit would be incomplete without a hike up the north drumlin, the highest point in the harbor. The view of the city and the island-studded harbor from the 157-foot-high summit, built atop a base of 80 feet of trash and a legacy of environmental neglect, is truly a spectacle. Metropolitan Boston unfolds in a breathtaking, unobstructed 360-degree panorama. South Boston appears to be right beneath your feet; even though it's four miles away, it seems as though you could reach out and wrap the city skyline in your embrace. From this vantage point, every sailboat, tanker, lobster boat, and ferry proclaims the vitality of this maritime city. In the view from the other side, the constellation of islands is perfectly laid across the shimmering surface of the harbor. Beyond Long Island, the white pillar of Boston Light points the way to the open sea. On clear days, you can see up the coast 40 miles to the north. Such a majestic vista is a fitting crown for this island gem, and it's the perfect spot for the sense of renewal to sweep over you like an ocean wave. Christopher Klein, author of "Discovering the Boston Harbor Islands" (Union Park, 2008), can be reached at christopherjklein@gmail.com. Ferries to Spectacle Island leave from Long Wharf in Boston and run daily through Oct. 13 and on weekends through Nov. 2. A round-trip ticket is $14 for adults, $10 for seniors, and $8 for children over age 3. A family four-pack of tickets is available for $42. Visit harborislands.org for ferry schedules and a listing of public programs. Marina reservations can be made by contacting Spectacle Island Marina at 857-452-7221 or hailing VHF 69. The day rate is $20 for vessels less than 30 feet and $30 for vessels 30 feet and more. The overnight rate (5:30 p.m. to 10:30 a.m.) is $1.75 per foot.